I do understand the need for knowledge about why we behave as as we do and what we think about this or that, maybe even how we got that opinion. It also happens that I contribute, sometimes just because it’s convenient for me or because of the actual subject – even though I not always fully know the intentions behind the survey. 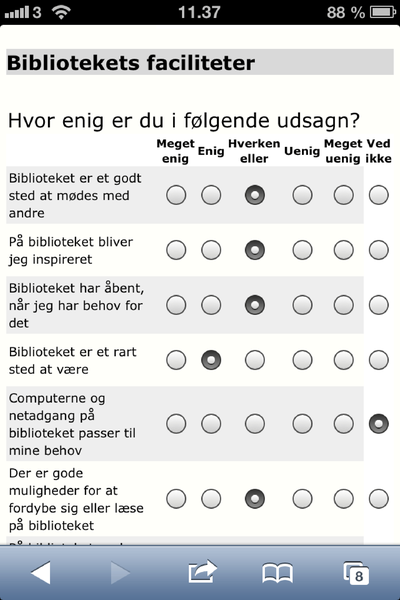 That’s why I found my self answering a small questionnaire that was handed to me at the local public library – I’m a regulary at the library and glad to help for whatever it is worth. The questions could even be answered on the road via a QR link to my phone. So far, so good. But then, over the next 25 minutes, I was reminded of why I tend to avoid to participate questionnaires: They often evoke the pedant, my hidden cantankerous grumbler, and that’s not exactly my favourite character. It’s all kind of problems that irritates me, minor glitches and major and sometimes even obstructive flaws – anyway, the only positive I see in this behaviour is that I don’t call the sender to point fingers. If I did, I would most certainly also have been a pain. Technical issues: buttons that don’t work, bad navigation, unexpected time-outs, etc. 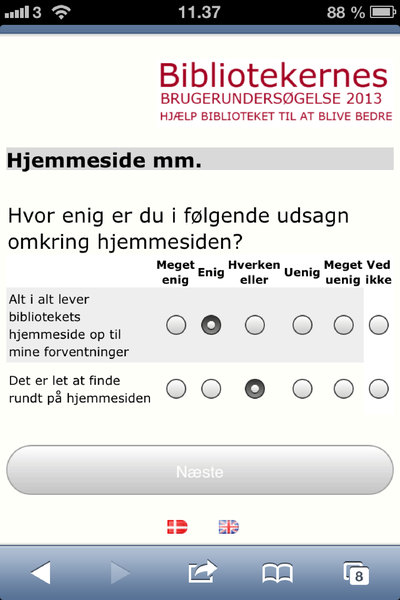 Contextual oddities, such as a web based questionnaire about mobile websites, which is not suitable to answer on a mobile. If I use the mobile for those, there’s a high probability that I quit before finish. And I guess that it will influence the result if many who are using the mobile for web browsing, do as I do. 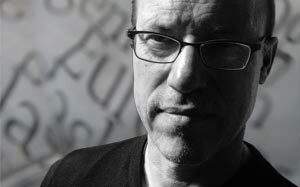 Questions, on which I need to agree on the premises, to be able to answer (or simply not think of). The library web site meets my expectations. As soon as I start considering my answer, I get stucked: How do I put it, if I have low expectations? Or high? The library has open when I need it. It has not, but I accept that it doesn’t serve the public 24-7. Now what to answer? The statements seem fairly simple, but if I don’t agree with (what appear to be) the premise of the statements, it’s suddenly very complicated. I may be a work related disorder: When I get an assignment, a question, I try the reason to the question, the question that lies behind what was asked. It is often the most convenient jst to answer, but it is rarely truly satisfying. 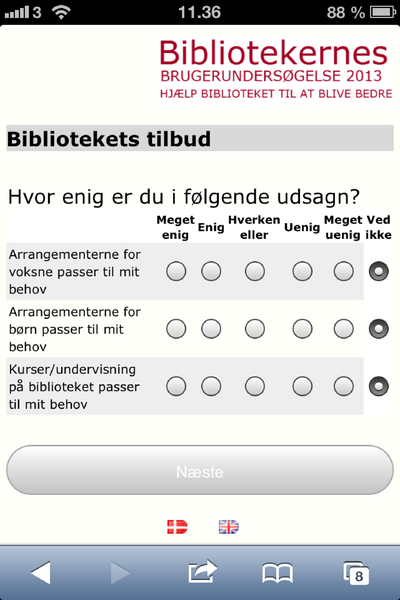 You may argue that a questionnaire about the opening hours of the library is not a psycology test, so just answer the bloody questions. But that’s my problem then, and the reason why I rather not participate in questionnaires.